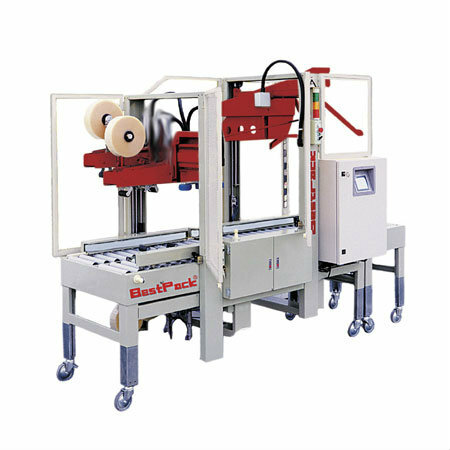 The BestPack CS4G High speed fully automatic adjustable carton sealer with Continuous Flo tape head system is for non-stop high speed sealing of random applications. The new Continuous Flo tape head system features four heads. Two tape heads on the top and two tape heads for the bottom. When a tape head runs low on tape, or if a tape head fails, the system will automatically switch heads so that there is continuous non-stop fl ow. There is a warning light that will tell an operator in the area that a tape head needs to be checked. In the mean time, the system is still sealing cartons. Two interchangeable top head and two separate bottom high speed, continous fl o tape heads.